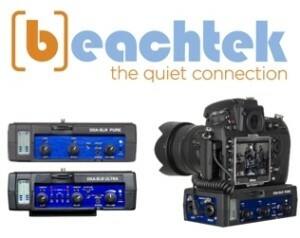 Beachtek manufactures audio adapters that allow our customers to connect professional audio recording equipment and microphones to their cameras without the need for cumbersome and complicated external recorder setups that require synchronisation in post production. In most cases, the weak points of current digital cameras are the built-in microphones and microphone pre-amplifiers. Using an external microphone (ie: Rode Videomics) and a Beachtek microphone pre-amplifier solves both problems without the need for separate equipment. Beachtek has been designing and building these camera/microphone accessories since 1997 and consistently rank throughout the world as one of the best and most popular solutions for the semi-pro and professional videographer. Their latest products, the DXA-SLR ULTRA and DXA-MICRO PRO push this concept even further with Studio grade microphone pre-amplifiers allowing for studio quality recordings directly to your camera’s memory for a fraction of the cost. Beachtek also offers models specifically designed for the ARRI ALEXA Mini and RED DSCM2. Whether you are a parent looking to improve your home movies, or a working professional shooting a big budget movie, Cam Caddie designs and manufactures a high quality line of camera accessories for just about anybody. Our flagship product is the award-winning Cam Caddie Scorpion camera stabilizer and DSLR support rig. The Scorpion allows you to mount virtually any camera. It does not matter if you have a DSLR, Mini DV, GoPro Hero, or even a smartphone. The Scorpion can handle them all! Cam Caddie’s ability to quickly adapt enabled them to offer the world’s first handheld support rig for DSLR cameras such as the Canon 5D MKII and Canon 7D. Cam Caddie continues to develop products to meet the ever changing needs of today’s ultra mobile, budget-conscious filmmakers. 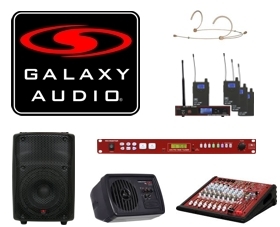 U.S.A. – Established in 1977, Galaxy Audio has since developed a full range of products like the extremely popular HOTSPOT personal close-up monitor (over 225,000 in use), the Check Mate Series of SPL meters & calibrators, ANYSPOT wireless in-ear monitoring systems, signal splitters & combiners as well as the popular Cricket polarity & cable checker. Galaxy Audio has also recently launched a full line of headset microphones available, including the universal HSA microphone for which adaptors can be purchased and interchanged, making it compatible with most manufacturer’s wireless systems. Galaxy Audio has also recently launched the Traveler, a battery powered speaker system with optional modules such as a CD/mp3 player, wireless receiver, delay module etc. 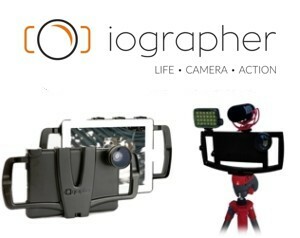 iOgrapher is an innovative designer and manufacturer of iPad and iPhone cases based in the USA. iOgrapher cases offer a unique blend of convenience, quality and affordability. Costing little more than the average iPad case, these cases offer solid grips to record stable video, practical accessory mounts for external microphones, lights or other accessories, they can be tripod mounted and are designed to accept any of our 37mm lenses (2x Telephoto and Wide-Angle) which add a wealth of possibilities to these IOS devices by minimising the use of the digital zoom. Available for most IOS devices. AUSTRALIA – The undeniable pioneer of the microphone revolution. For over 20 years now, RODE Microphones has been led by Peter Freedman, a visionary that has designed and created manufacturing techniques that make it possible for RODE to produce premium professional quality microphones at a fraction of the price of the competition. RODE has won countless major awards for innovation and technical excellence, often more than once. 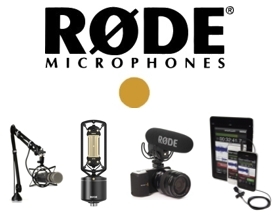 Although Rode is most recognized for it’s large diaphragm studio condenser microphones for recording, it’s recent developments in other audio branches have been equally successful: live sound, broadcast and film microphones, the VideoMics, the NTG shotguns, RODElink wireless systems and a complete line of complimentary accessories. RODE microphones are world renowned for their excellence in performance, aesthetics and value. Today, Rode microphones are used by nearly every recording studio and film productions on the planet and are one of the most “heard” microphones on recordings everywhere. In 1969, Rycote introduced the first windshield system used for Location Sound and ENG. Since that time, they have focused all their efforts to refine their technology with industry-leading innovations for wind, shock and handling protection. 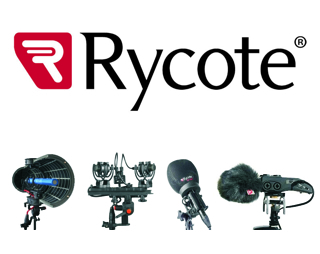 With a wealth of versatile tools designed to deliver outstanding audio while withstanding the harshest environments and the rigors of daily use, Rycote remains the most trusted brand by professionals. Rycote’s high quality products are used in all corners of the world in every market segment including: Production sound, News broadcast, Sports broadcast, on-camera sound, Studio and Live sound. Trust Rycote to help you capture best possible audio, no matter how tough the going gets.